Not to be confused with Legitimacy (family law). In political science, legitimacy is the right and acceptance of an authority, usually a governing law or a régime. Whereas "authority" denotes a specific position in an established government, the term "legitimacy" denotes a system of government—wherein "government" denotes "sphere of influence". An authority viewed as legitimate often has the right and justification to exercise power. Political legitimacy is considered a basic condition for governing, without which a government will suffer legislative deadlock(s) and collapse. In political systems where this is not the case, unpopular régimes survive because they are considered legitimate by a small, influential élite. In Chinese political philosophy, since the historical period of the Zhou Dynasty (1046–256 BC), the political legitimacy of a ruler and government was derived from the Mandate of Heaven, and unjust rulers who lost said mandate therefore lost the right to rule the people. In moral philosophy, the term "legitimacy" is often positively interpreted as the normative status conferred by a governed people upon their governors' institutions, offices, and actions, based upon the belief that their government's actions are appropriate uses of power by a legally constituted government. The Enlightenment-era British social philosopher John Locke (1632–1704) said that political legitimacy derives from popular explicit and implicit consent of the governed: "The argument of the [Second] Treatise is that the government is not legitimate unless it is carried on with the consent of the governed." The German political philosopher Dolf Sternberger said that "[l]egitimacy is the foundation of such governmental power as is exercised, both with a consciousness on the government's part that it has a right to govern, and with some recognition by the governed of that right". The American political sociologist Seymour Martin Lipset said that legitimacy also "involves the capacity of a political system to engender and maintain the belief that existing political institutions are the most appropriate and proper ones for the society". The American political scientist Robert A. Dahl explained legitimacy as a reservoir: so long as the water is at a given level, political stability is maintained, if it falls below the required level, political legitimacy is endangered. Charismatic legitimacy derives from the ideas and personal charisma of the leader, a person whose authoritative persona charms and psychologically dominates the people of the society to agreement with the government's régime and rule. A charismatic government usually features weak political and administrative institutions, because they derive authority from the persona of the leader, and usually disappear without the leader in power. However, if the charismatic leader has a successor, a government derived from charismatic legitimacy might continue. Theocracy: Egyptian divine authority, Horus as a falcon. In a theocracy, government legitimacy derives from the spiritual authority of a god or a goddess. In ancient Egypt (c. 3150 BC), the legitimacy of the dominion of a Pharaoh (god–king) was theologically established by doctrine that posited the pharaoh as the Egyptian patron god Horus, son of Osiris. 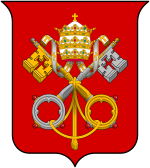 Theocracy: The coat of arms of the Holy See, the seat of Papal government. In the Roman Catholic Church, the priesthood derives its legitimacy from a divine source; the Roman Magisterium dogmatically teaches that Jesus Christ designated St. Peter the supreme and infallible head of the entire Christian Church, and thus each bishop of Rome is sanctified, legitimate, and possesses these charisms as well. The political legitimacy of a civil government derives from agreement among the autonomous constituent institutions—legislative, judicial, executive—combined for the national common good. One way civil society grants legitimacy to governments is through public elections. There are also those who refute the legitimacy offered by public elections, pointing out that the amount of legitimacy public elections can grant depends significantly on the electoral system conducting the elections. In the United States this issue has surfaced around how voting is impacted by gerrymandering and the repeal of part of the Voting Rights Act in 2013. Another challenge to the political legitimacy offered by elections is whether or not marginalized groups such as women or those who are incarcerated are allowed to vote. Civil legitimacy can be granted through different measures for accountability than voting, such as financial transparency and stake-holder accountability. In the international system another method for measuring civil legitimacy is through accountability to international human rights norms. In an effort determine what makes a government legitimate the Center for Public Impact launched a project to hold a global conversation about legitimacy stating, inviting citizens, academics and governments to participate. The organization also publishes case studies that consider the theme of legitimacy as it applies to projects in a number of different countries including Bristol, Lebanon and Canada. The United Nations Human Rights Office of the High Commission (OHCHR) established standards of what is considered "good governance" that include the key attributes transparency, responsibility, accountability, participation and responsiveness (to the needs of the people). Assessing the political legitimacy of a government can be done by looking at three different aspects of which a government can derive legitimacy. Fritz Scharpf introduced two normative criteria, which are output legitimacy, i.e. the effectiveness of policy outcomes for people and input legitimacy, the responsiveness to citizen concerns as a result of participation by the people. A third normative criterion was added by Vivien Schmidt, who analyzes legitimacy also in terms of what she calls throughput, i.e. the governance processes that happen in between input and output. Abulof distinguishes between negative political legitimacy (NPL), which is about the object of legitimation (answering what is legitimate), and positive political legitimacy (PPL), which is about the source of legitimation (answering who is the 'legitimator'). NPL is concerned with establishing where to draw the line between good and bad, PPL with who should be drawing it in the first place. From the NPL perspective, political legitimacy emanates from appropriate actions; from a PPL perspective, it emanates from appropriate actors. In the social contract tradition, Hobbes and Locke focused on NPL (stressing security and liberty, respectively), while Rousseau focused more on PPL ("the people" as the legitimator). Arguably, political stability depends on both forms of legitimacy. Weber's understanding of legitimacy rests on shared values, such as tradition and rational-legality. But policies that aim at (re-)constructing legitimacy by improving the service delivery or 'output' of a state often only respond to shared needs. Therefore, substantive sources of legitimacy need to be distinguished from more instrumental ones. Instrumental legitimacy rests on "the rational assessment of the usefulness of an authority ..., describing to what extent an authority responds to shared needs. Instrumental legitimacy is very much based on the perceived effectiveness of service delivery. Conversely, substantive legitimacy is a more abstract normative judgment, which is underpinned by shared values. If a person believes that an entity has the right to exercise social control, he or she may also accept personal disadvantages." Max Weber: societies are politically cyclical. Max Weber proposed that societies behave cyclically in governing themselves with different types of governmental legitimacy. That democracy was unnecessary for establishing legitimacy, a condition that can be established with codified laws, customs, and cultural principles, not by means of popular suffrage. That a society might decide to revert from the legitimate government of a rational–legal authority to the charismatic government of a leader; e.g., the Nazi Germany of Adolf Hitler, Fascist Italy under Benito Mussolini, and Francoist Spain under General Francisco Franco. Democracy: In a democracy, government legitimacy derives from the popular perception that the elected government abides by democratic principles in governing, and thus is legally accountable to its people. Fascism: In the 1920s and the 1930s, fascism based its political legitimacy upon the arguments of traditional authority; respectively, the German National Socialists and the Italian Fascists claimed that the political legitimacy of their right to rule derived from philosophically denying the (popular) political legitimacy of elected liberal democratic governments. During the Weimar Republic (1918–33), the political philosopher Carl Schmitt (1888–1985)—whose legal work as the "Crown Jurist of the Third Reich" promoted fascism and deconstructed liberal democracy—addressed the matter in Legalität und Legitimität (Legality and Legitimacy, 1932), an anti-democratic polemic treatise that asked: How can parliamentary government make for law and legality, when a 49 per cent minority accepts as politically legitimate the political will of a 51 per cent majority? Monarchy: In a monarchy, the divine right of kings establishes the political legitimacy of the rule of the monarch (king or queen); legitimacy also derives from the popular perception (tradition and custom) and acceptance of the monarch as the rightful ruler of nation and country. Contemporarily, such divine-right legitimacy is manifest in the absolute monarchy of the House of Saud (est. 1744), a royal family who have ruled and governed Saudi Arabia since the 18th century. Moreover, constitutional monarchy is a variant form of monarchic political legitimacy which combines traditional authority and legal–rational authority, by which means the monarch maintains nationalist unity (one people) and democratic administration (a political constitution). ^ Chen, Jing (2016). Useful Complaints: How Petitions Assist Decentralized Authoritarianism in China. New York: Lexington Books. p. 165. ISBN 9781498534536. ^ O'Neil, Patrick H. (2010). Essentials of Comparative Politics. New York: W.W. Norton & Company. pp. 35–38. ISBN 978-0-393-93376-5. ^ Dews, Fred (2017-07-06). "A primer on gerrymandering and political polarization". Brookings. Retrieved 2018-06-26. ^ Liptak, Adam. "Supreme Court Invalidates Key Part of Voting Rights Act". Retrieved 2018-06-26. ^ "Governance & Accountability". www.hks.harvard.edu. Retrieved 2018-07-10. ^ "Home - Financial Transparency Coalition". Financial Transparency Coalition. Retrieved 2018-07-10. ^ "Finding Legitimacy". findinglegitimacy.centreforpublicimpact.org. Retrieved 2018-07-10. ^ "Viewpoints - Centre for Public Impact (CPI)". Centre for Public Impact (CPI). Retrieved 2018-07-10. ^ "Good Governance and Human Rights". OHCHR. Retrieved 2018-07-10. ^ Abulof, Uriel (2015). "Can't Buy Me Legitimacy": The Elusive and Illusive Stability of Mideast Rentier Regimes. Journal of International Relations and Development. ^ a b c Weigand, Florian (April 2015). "Investigating the Role of Legitimacy in the Political Order of Conflict-torn Spaces" (PDF). SiT/WP. 04/15. ^ Initially published as Gallie (1956a), then as Gallie (1964). ^ Garver (1978), p. 168.